It is definitely Barbosella time in the Greenhouse with lots of Barbosella australis in flower (see day 610) and now this lovely minature species coming into flower too. 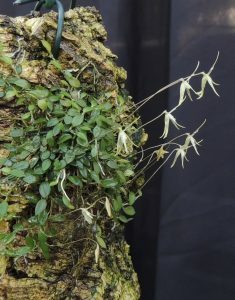 Barbosella dusenii is our orchid with the smallest leaves. The leaves are a few mm long and produced on a creeping rhizome with relatively gigantic flowers produced in a mass in late summer. We grow the species mounted which it clearly enjoys and avoids the threat of the plant becoming smothered in moss. The species is native to Brazil where it is found in cloud forests at around 1000m. We replicate these conditions in Cool Americas by hanging plants low down in the greenhouse and spraying daily with a minimum of 12C.